After having written about implementing a VGA controller in Verilog I wanted to improve it with a new functionality: the Text mode. on a computer screen in terms of characters rather than individual pixels. The purple boxes are combinatorial logic realizing the translation between screen’s coordinates and the memories addresses, the grey boxes instead are flip-flops intended to sync signals between the different internal blocks of the module: this will be explained later. With respect to the previous VGA controller here we have two new elements: the ROM with the predefined glyph and the Text RAM containing the characters I want to display on screen. These are memories. The hvsync_generator is pratically unchanged from the version of the previous post. A memory is a device capable of storing and accessing data (you know, memory); usually are characterized by its address width and output width. Since I’m using a spartan-6 FPGA I have access to some primitive useful to generate memories using the Core generator (here a guide: Spartan-6 FPGA Block RAM Resources). the clock (CLKA) signal is obvious, the other are the address line (ADDRA) and the output (DOUTA); the width of these lines are determined by the organization of the memory you need. 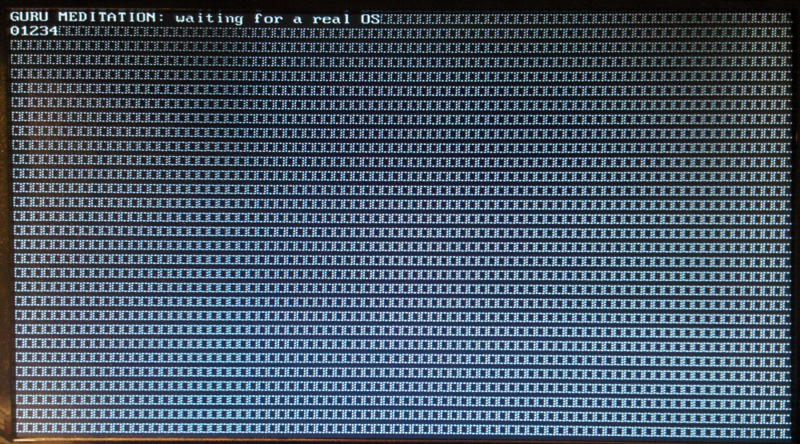 Different story is the RAM: I need a read and write memory device that will contain an ASCII character index for each one of the block in which the screen is divided; being the size of each character be 8x16 we have, for a resolution of 640x480, 80 columns and 30 rows. This means the we need 2400 bytes, i.e. the memory organized as 2400x8. Since I need to write, there are two signal lines for that (DINA and ADDRB) that in this implementation will remain unused. How we translate the screen’s coordinates into text memory address and glyph memory address? Also here the multiplications by power of two are implemented with simpler left shifts. To display characters I need obviously some of them; for this project I used the Unicode VGA font. This font is distributed using the BDF format. In order to be used into the Xilinx IDE, the glyph must be converted into a COE format, that is simply a binary representation of the words into the memory. Since I didn’t know any program that does that, I modified an existing program that converts BDF glyphs into C header files and added the option to dump in the needed format: the repo is here bdf2c but don’t look at the code, is very ugly :P.
and synthetized with the Xilinx tools the design. The first attempt for this controller had some issues with timing, something like the situation described here. Roughly speaking, every memory block needs one clock cycle to output the value it’s storing, since we have two memories in series we need two clock cycles to obtain the pixel values to output on the screen. So the pixel data and the hsync and vsync signals are out of synch causing the character to be not aligned to the side of the screen. Another connection that needs an explicit synchronization is the combinational logic that translates the screen’s coordinates for the glyph ROM: as just said, only after one clock cycle the ASCII value is output from the text memory, so using directly the glyph coordinates derived from the screen ones gives you the wrong glyph data; this is the reason for the sequential always@(posedge clk) instruction. I want to stress here that the approach chosen is to delay the signals out of synch in order to align it; this is accomplished using some flip flops. but thanks to a chapter of “FPGA prototyping by Verilog examples” I realized that is simpler to “slow down” the signals; it’s not probably a solution for all the use cases, but this particular one, where the signal data is generated continuosly, I think is a good situation. My advice, when some issue arises from a design, is to draw explicitely a diagram of the different blocks composing your system like my awesome™ hand-drawn scheme. In this way you can see clearly the timing and connections. The best way however is to create a reliable testbench to test the design, but this is a topic for another day. If you are interested in the project, the source code can be found on github.